Step into some easy funk with a Scottish pop-rock duo. 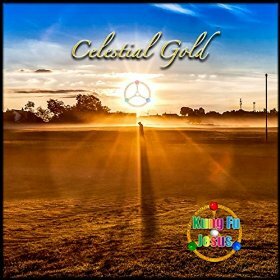 Kung Fu Jesus has a new album, Celestial Gold, and it is quite the groovy mix. The heavy snare-led, 70’s-sounding tune, “Double Dragon,” is countered by the jumpy, echo back beat and organ of “Fenris Wolf” and the nearly MOR (70’s-sounding again), sand-papery groove of “Golden One.” The effected electric guitar lead over the doubled, sweet vocal harmonies make this groove especially infecting. The light music of “Kurt Kobain” (it reminds me of Men Without Hats, in their lighter moments) belies the heavy lyrics about pain here. We get another stupendous use of 70’s sensibilities on three of what might be my favorite tunes. “Rainbow Road” is basically just its groove and soft vocal, but it truly works as a tune about where lovers can go. “Smartphones” is a faster flick of a train-running beat with phone tones and a lyric commenting on where we sadly are right now as a nation. “The White Wind” has its drums and keys mixed together creating another big bed of a groove, all under a very distinct lyric. Kung Fu Jesus is giving us a lot to listen to and consider on Celestial Gold and you need get on board!